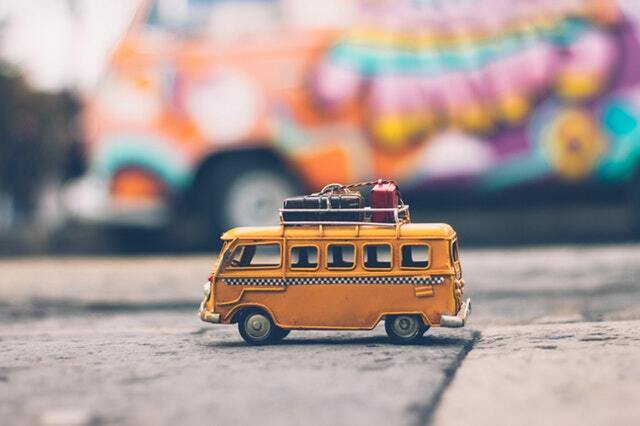 With the holidays approaching, there might be some traveling in your future. I thought this would be a good time to share what I learned this past summer about toddler sleep on vacation. Over the summer we traveled with our 3-year-old twins on (2) week-long vacations. 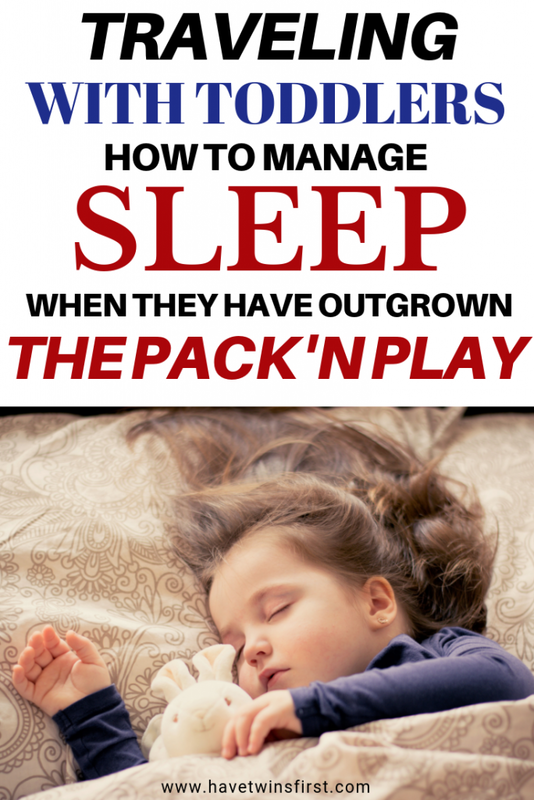 On these trips we faced the new obstacle of the girls no longer sleeping in Pack N Plays. They now sleep in regular beds. This means they are able to get out of bed. Luckily, we managed to survive two weeks away, with two different sleeping arrangements. It wasn’t always a smooth transition, but, by the end of the trips we felt like we had figured out tricks for good toddler sleep on vacation. Having the twins sleep in beds (and not Pack ‘N Plays) away from home for the first time was definitely stressful. Additionally, we had to tackle different sleeping arrangements for each trip. In the first place we rented, their room had twin beds. While, in the second place, they shared a double bed. At the start of both trips, they would either be crying or goofing off at bedtime for the first 2-3 nights. Our strategy was to wait as long as possible before returning to their room. If they continued goofing off we would take something away temporarily, like a stuffed animal. The good news is after a couple nights they were used to their sleeping arrangements and bedtime was smoother and quicker. It was also nice to see they could sleep well while sharing a bed, since this was a new experience for them. If you plan to travel often with a toddler, practice makes perfect, right? The thought of figuring out toddler sleep on vacation will be less stressful the more you do it. Before I list my tips for toddler sleeping arrangements on vacation, it’s important to have a little background on the twins’ sleeping habits at home. About 1 month before our first trip we went through the process of transitioning the girls from sleeping in cribs to sleeping in their toddler beds. This way they would have practice before our vacations. The less change you need to introduce, the better. The conversion to the new beds went pretty smoothly. They were excited to sleep in “big girl beds”. Overall, bedtime in our house is hit or miss. Depending on the night, J tries as many tactics as possible to get you back in the room (including crying and getting out of bed). Meanwhile, S will hang out in her bed and play with her stuffed animals for up to an hour before going to sleep. 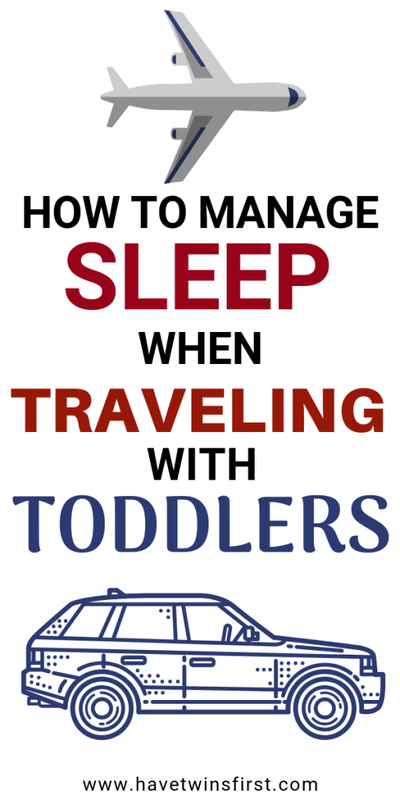 With that background, here are my tips for getting toddlers to sleep well when traveling. Tell your toddler what to expect before leaving – a few days before your trip let your toddler know you are going away. If you know the sleeping arrangement, tell him what it will be. If you have pictures, show him pictures of where you are going. Establish sleeping arrangements as soon as you arrive – when you arrive at your destination figure out where the kids will sleep. Set up the room as needed. In our case we needed to put up bed rails, set up the monitor, and put sheets on the bed. Show your kids where they will be sleeping – once the room is set up, but before bedtime, bring the kids to the room so they can see where they will sleep. Let them pick something for bedtime. Some examples are the bed they want to sleep in or a book they want to read at bedtime. Bring a monitor – a video monitor is best. It will ease your mind that your children are safe and help you decide if you need to go back in their room after lights out. It also gives you the ability to go to other parts of the house or outside if you want. Bring something from home – my kids are not super attached to a stuffed animal, but I still find it useful to have something they recognize from home for comfort. Establish rules – I have found it really helpful to have a few rules for the kids at bedtime. For example, two big ones are “don’t get out of bed” and “no crying”. Do my kids always follow these rules? Absolutely not! But, they know they are supposed to follow them. If your kids break a rule, ask them to repeat the rules back to you, then remind them to follow them. Leave them alone – this will be much easier if you have a monitor. Return to their room as few times as possible after lights are out. You might have to let them cry for a few minutes and return if they still have not stopped. Exhaust them – if you are on vacation, there is a good chance there will be plenty of opportunity for the kids to run around. The more tired they are, the easier they will go to bed. Before I sign off I also wanted to share these ingenious tips for traveling with kids. I thought these tips were really helpful for the other parts of your trip when you’re not trying to get your toddler to sleep on vacation. If you are traveling with toddlers this holiday season, I hope you find these tips helpful. Enjoy your time with family and friends, and maybe even get some sleep!